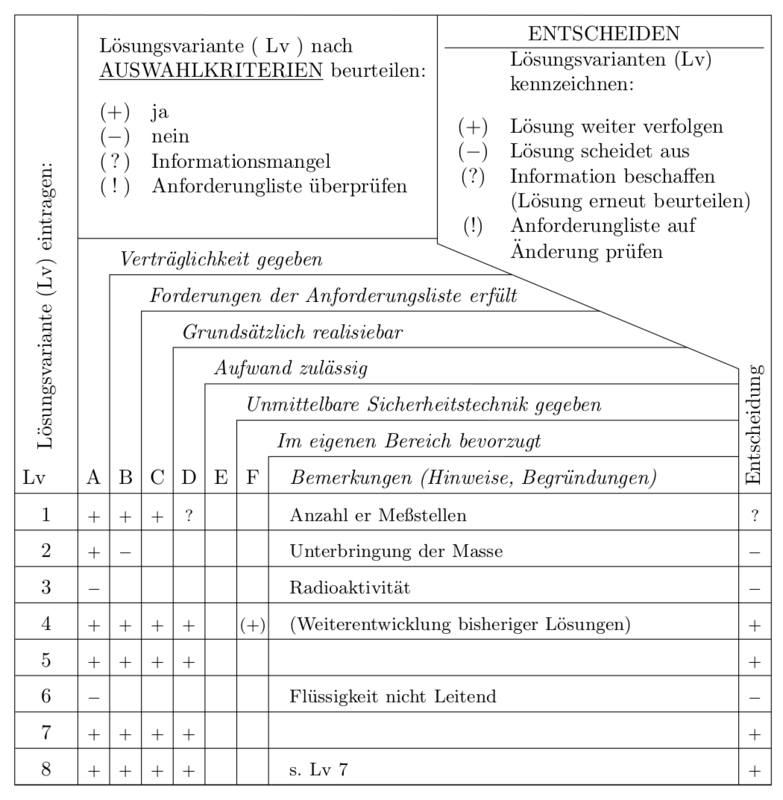 Is there a tool to make a complicated Table like this one (“Auswahlliste” from “Pahl/Beitz Konstruktionsmethodik”)? I’m developing a product as a part of my thesis for my university in Germany. We are supposed to use standard methodology for decision making. One of the tools is called “Auswahlliste”. (I don’t even know how to translate it. Maybe “choice list”.) It has a peculiar look, but it’s well accepted among academics in Germany. But just thinking about creating it in tabular environment scares me. What would you suggest? Would you try to make it with Tex-measures or would you just make a Table in Excel or any other WYSIWYG software and import it as PDF? Is there a suitable tool to draw such wicked tables in Tex-world? This figure was taken from the book Pahl/Beitz Konstruktionslehre, ISBN 978-3-642-29569-0. To clear any confusion: I don’t have to make this table look like this at all costs. It’s just a standard table design used in German industry. I acknowledge all the flaws of this design and its lack of readability. I myself had a hard time understanding it at first glance. But still it’s the broadly accepted standard here and I would like to know whether it is possible to draw it with LaTeX tools. If I was trying to change the shape of it to fit my taste, I wouldn’t post this question. 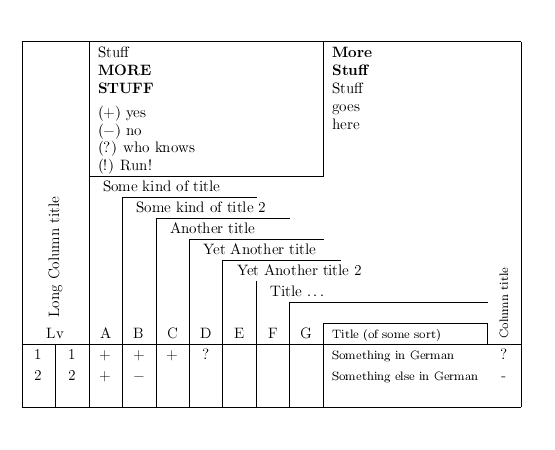 Here is the third revision of my approach to programmatically create such diagrams, using TiKZ. Preamble and definitions follow below: this code is meant to demonstrate the interface to the environments/macros which I define. The table is constructed by making simple macro calls, and inputting the contents of the table as one would a normal table in LaTeX. This allows for the easy construction and customization of the output. Having said that, this code should produce reasonable results for simple inputs, and is hopefully robust to minor tweaks. Below is the code to produce the above example document. The various lengths can be varied to taste, and the typefaces can be used to control the appearance of the text in the table. The macro \AddCriterion is meant to be the user interface to define the criteria of assessment in the table. We also define a counter to keep track of the position of the Remarks column, depending on the number of criteria to be assessed. The environment clears the list of criteria and resets the number of the remarks column, and then allows the user to specify a list of commands to initialize the parameters of the table (e.g. the criteria list, the item title, etc.). It then constructs the table using the "legend" (the large table cell in your example containing the descriptions of the labels (+), (-), etc.) as the foundation. 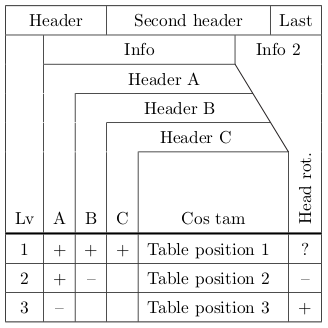 The label for Remarks column is defined relative to the position of the last criterion, and defines the bottom of the table-headers. 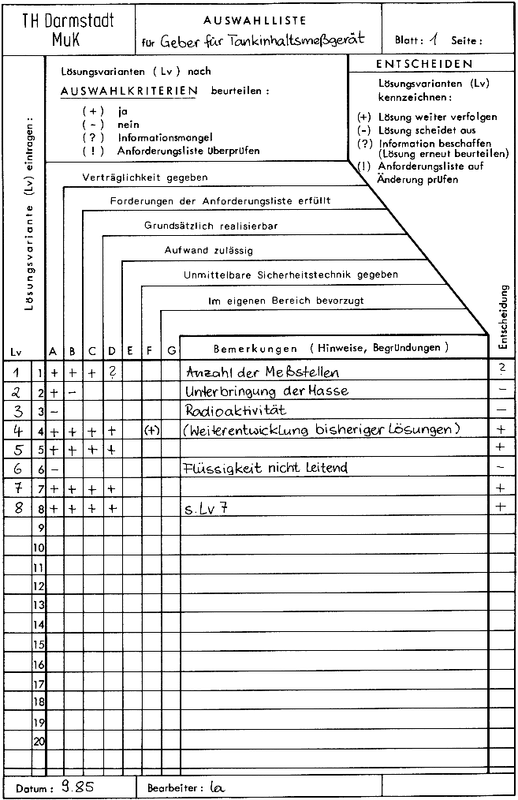 The position of the Legend cell and the Remarks column determines the position of the header of the left-most column, and its title. The position of the Legend cell and the Remarks column also determines the position of the Assessment column, and its legend, which may in principle overlap some of the criteria labels. At the end of the environment, all of the divider lines of the table are drawn. Macros for the Legend and the description of the Assessment are likely to be the same for several tables: these are contained in \pboxes whose size will shrink down to the size of their contents. All other customizations presumably should be done on a table-by-table basis (and so should be done as part of the argument to the table), or involve the helper macros and lengths defined above. \B"- " " " " \kern16mm " " " " \E"
How to make this table? How to make a table with subcolumns like this? How would I make a table like this? How do I create this complicated table in latex? How i make like this table?